When it rains, it pours, and that's causing havoc across the US. Islip, New York, has received an astounding 13.27 inches of rain in 24 hours, breaking a record set during tropical storm Irene back in 2011, according to the National Weather Service. Officials declared a state of emergency today and reported that one motorist was killed on the Long Island Expressway after a collision with a tractor trailer. In Michigan, parts of major highways near Detroit are still shut down after six inches of rain fell Monday in a matter of hours. Record-breaking rain storms like the ones this week, climate scientists say, are something people should get used to as they continue to warm the planet. Heavy downpours have already increased significantly across the U.S. since 1958, researchers say, especially in the Northeast and Midwest. The graphic here shows the observed increases in rain falling in “very heavy events” from 1958 to 2012. The most dramatic increase, 71 percent, is in the Northeast according to the latest U.S. National Climate Assessment report released in May. What’s the future hold? As long as humans keep increasing the output of heat-trapping greenhouse gases into the atmosphere, climate models project that torrential rains will increase significantly. 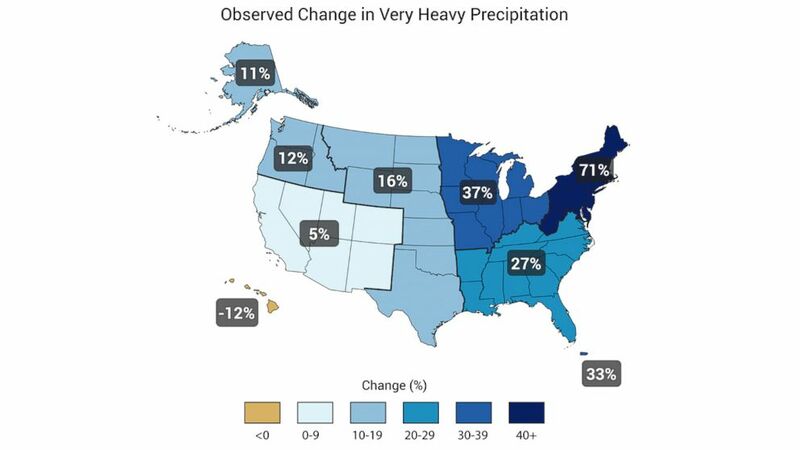 “Heavy precipitation events that historically occurred once in 20 years are projected to occur as frequently as every 5 to 15 years by late this century,” according to the climate report. “Confidence is high that further increases in the frequency and intensity of extreme precipitation events are projected for most U.S. areas,” the report notes, cautioning that predicting future precipitation events is subject to a variety of meteorological conditions and the ability of long-term climate models to simulate them. Those models, however, predict that not everyone will see increased rainfall. Some areas, such as the drought-parched Southwest U.S., may get drier while the wet regions will get wetter.